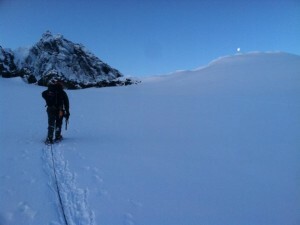 Last week on the upper slopes of Mount Baker, otherwise known as The Roman Wall, I was able to physically push myself. Several other climbers were on the mountain but had either turned around or were still heading up far below me. 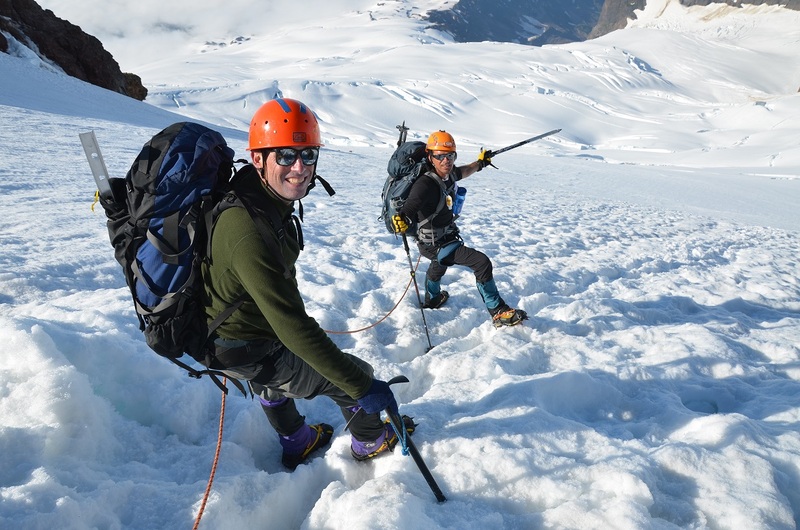 It was the only forecasted good “weather window” in a 10-day period and some of us were trying to take advantage of it to get in our spring training for climbing Mt Baker this summer. I was out front kicking steps in the soft, uneven snow-pack. The higher I got the steeper the slope became, the higher the cold wind began to blow and the more tired I was getting. So far I had only drunk half a quart of water and ate a chocolate chip cookie in the nearly ten hours I had been walking uphill. More then once I came close to turning around this morning but the lure of the windswept summit of Mt Baker beckoned me onward and upward. Still I felt very alone. The other climber I had started out with was, “dogging it” creating a wider distance between us minute by minute. As I neared the top of the wall, he had become nothing more then a spec on a white blanket of winter snow. Strangely this also gave me a mental boost thinking I was stronger then I actually am ( he was just really doing poorly that day for sure and knowing he was 20+years younger also made me feel a lot better! ). I did make the Mt Baker summit, it was as far away as I remembered, but my pace had become slower and slower until I actually saw the very top. I took a few shots from the summit with my IPhone until the battery died in the strong winds and intense cold. Within minutes of leaving to head down I was in whiteout conditions ( inside the clouds ). I carefully but quickly made my way down the step section until I ran into a couple of other climbers including my climbing partner. As we descended I had to stop to re-energize a few times. A few bites of a candy bar, a small packet of nuts and half a quart of water were enough to get me back down…and just knowing a hot meal, shower and a set of wheels were waiting for me on the horizon! If climbing Mt Baker 2015 is one of your goals, I encourage you to continue your spring training!